Tomatoes! | Arthur in the Garden. 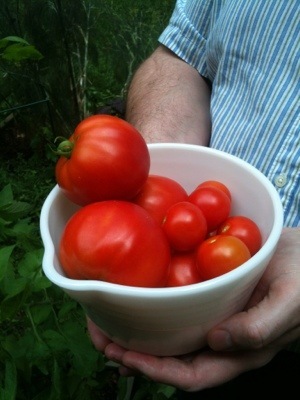 The tomatoes are performing exceedingly well this season. I chose one large variety, Better Boy, and one smaller, cherry tomato type, Large Cherry Red. Each year I add a few bags of Miracle-Grow Garden Soil in each raised bed to improve the soil. It has a time release fertilizer which slowly releases nutrients over about a three-month period.